Barça's Lionel Messi scored a lot of goals this year. 86 of them, apparently. * That's a record for a soccer player. Or is it? 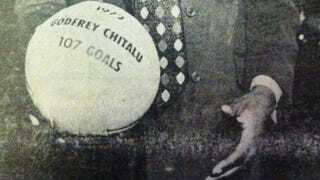 Zambia's Godfrey Chitalu—whose heyday as a player came in the late 1960s and 70s, before he began coaching in the 80s—may have scored 116 goals in 1972. On this week's excerpt from Slate's Hang Up and Listen podcast, Josh Levin looks at Chitalu's great season, and his long career in the game, which came to a tragic end nearly 20 years ago. * Update: 86 broke the record. He's at 90 goals now.